For any and all special occasions come to City Brew Tours NYC for an unforgettable event! For any birthday, anniversary, or holiday there is not better way to celebrate than tasting the finest craft beer that the Big Apple has to offer. There is a perfect beer – or beers! 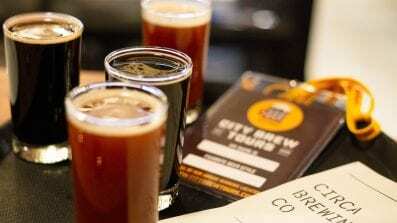 – for every occasion and you are certain to find it on a City Brew Tour in Brooklyn. Reserve an entire bus for one of our daily scheduled tours or customize your very own unique private tours for an experience that is all your own! Join one of our daily and nightly public tours or let us customize a special Private Tour for you and your group. We’ve been delivering high-class craft beer tastings since 2008 so we know how to give you the most entertaining, fun, and informative brew tour possible! 12-16 beers, beer-centric meal at one of our great Brooklyn’s brewpubs, a dedicated planner to make your event amazing, selection of your desired brewery preferences from available locations, plus your tour is closed to the public. Please inquire if you are looking for shorter options or are not interested in the meal component of the tour.